This is the fifteenth book in Lawrence’s popular ‘The Roman Mysteries’ series about four friends, Flavia, Nubia, Jonathan and Lupus, who have adventures and solve mysteries in the ancient world. This one finds them shipwrecked off the coast near Alexandria in 81AD. A mystery centred around the Museum at Alexandria presents itself, and the young detectives are soon employed in sorting it out as well as working out the riddles posed by Philologus, the Head Scholar in the Museum. It seems too that Nubia has found her family and romance; whether this will signal the end of the foursome is another question to be resolved. Lawrence’s books are well supported with information about the period and locale in which they are set. 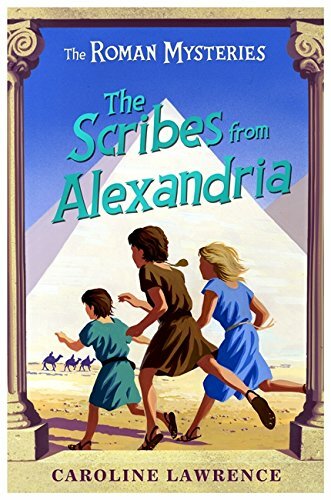 Here maps of Alexandria and Egypt in 81AD and the Latin alphabet translated into hieroglyphs as well as a glossary signal the reason why the series is popular in schools as well as with young readers who want a gripping mystery adventure story.